In the summer of 2006, I started having trouble shifting into 1st and 2nd gear. The problem was initially aggravated by heat (warm ambient temperature combined with a long drive cycle), but later started rearing its head at random times irrespective of transmission temperature. 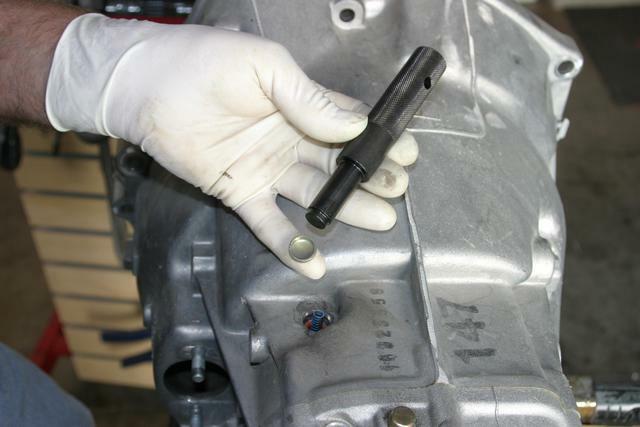 A catch pin issue was addressed in service bulletin 23 01 02 (881), using the catch pin replacement instructions from the TIS. There was a related service bulletin 23 01 04 (063) for a symptom I've seen reported on other M roadsters: gear shift lever does not return to center. I decided to address that issue using the locking pin bushing replacement instructions from the TIS while fixing the catch pin issue, since I'd have the transmission out. Too bad it wasn't time for a new clutch. Each of the 3 from-the-top catch pins can be in one of three detents on the top of its respective fork. 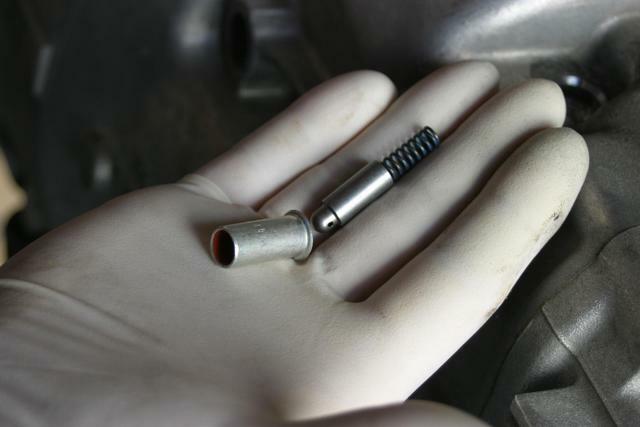 In order for a fork to be moved when changing gears, its catch pin must slide up in its bore (against the pressure of the catch pin's spring). 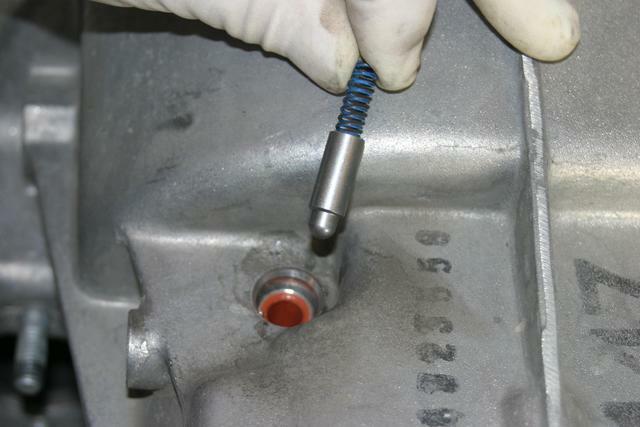 If the catch pin gets stuck in its bore in the extended position, the fork can't be moved. If you try to force the shift, you risk damaging the catch pin and/or its bore. In my case, the catch pin for the 1st and 2nd gear fork was sticking in its bore. 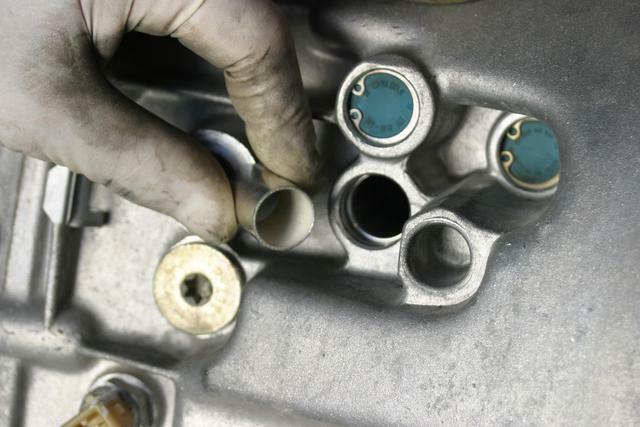 Punch a hole in each sealing cap, screw in the BMW mini slide hammer tool, and take out the sealing caps. There are 3 of these in the top of the transmission, from front to rear. Remove the spring and catch pin. 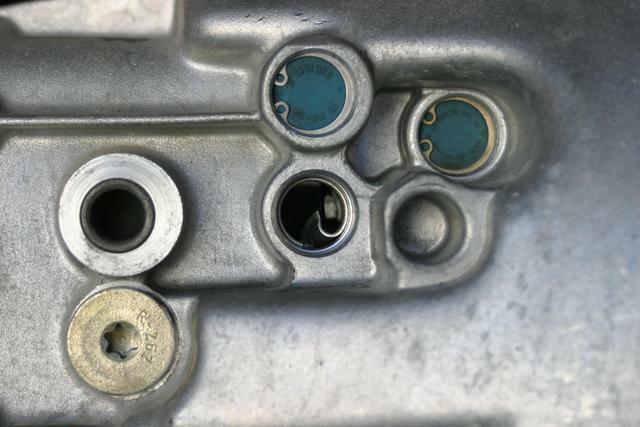 We used the BMW mirror switch removal tool to lift the catch pins out; they're hollow inside. 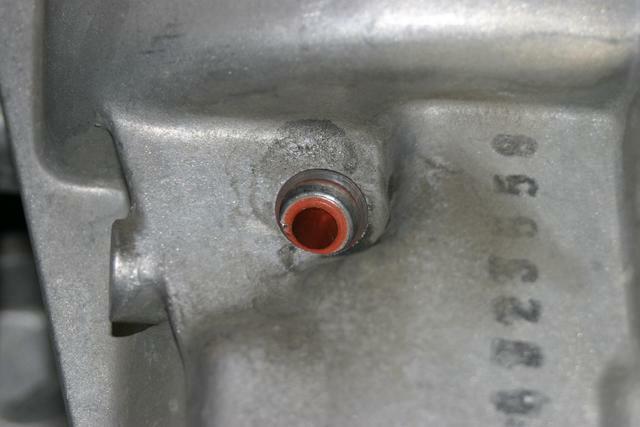 Below is a picture of the original sealing cap, spring and catch pin. A new lined bushing and new catch pin with new spring in Randy's hand. 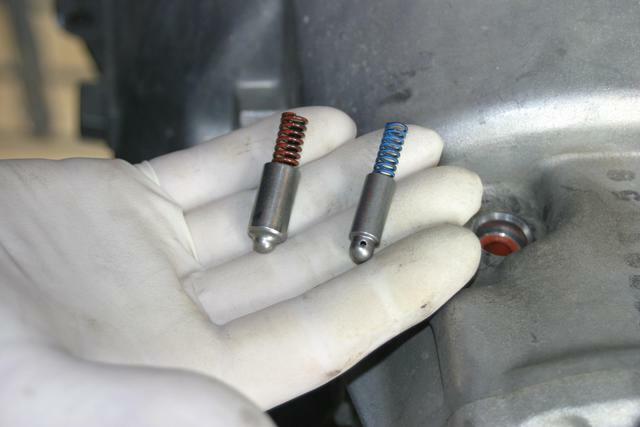 The old catch pin and spring (red) on left, the new catch pin and spring (blue) on the right. Put the new catch pin bushing on the BMW drift. 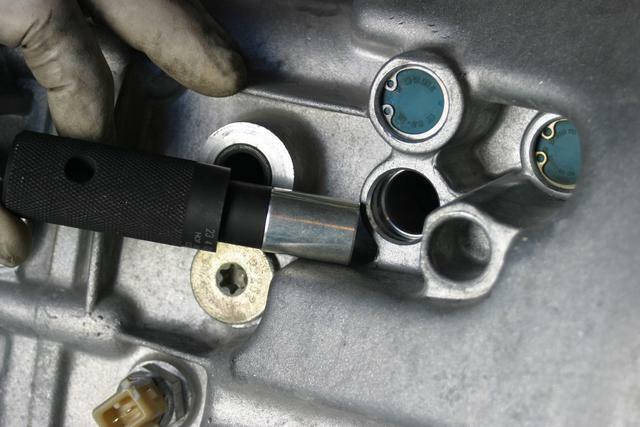 Tap the new catch pin bushing into place with the BMW drift. New bushing installed. Note that the split in the bushing is oriented toward the left side of the transmission. 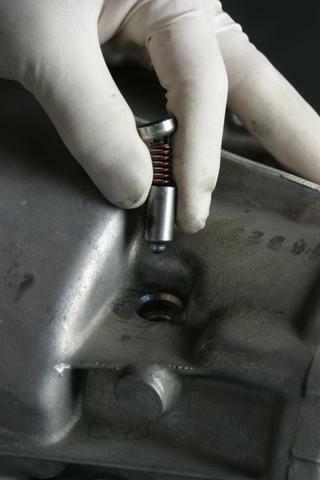 Install the new catch pin with its new spring. Install the new sealing caps using another BMW drift. I didn't take as many pictures here. 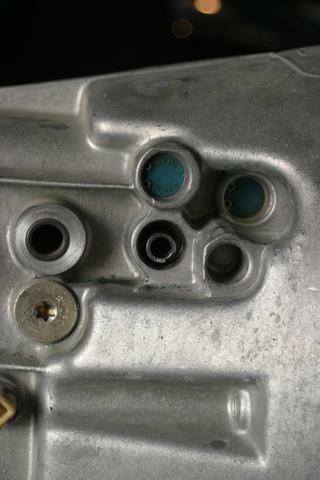 This one shows the locking pin for reverse already done (blue cap at top center). It's essentially the same deal as the shift catch pins except there's an internal snap ring holding each cap. 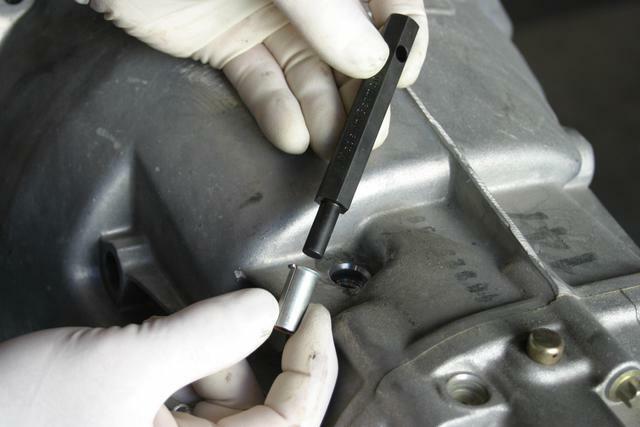 Remove the snap ring, punch a hole in the plastic-coated metal sealing cap, and remove it with the slide hammer. The sealing cap is removed for 5th gear in this picture, and the end of the spring is visible. It's the bore beneath the blue sealing cap for the reverse locking pin. 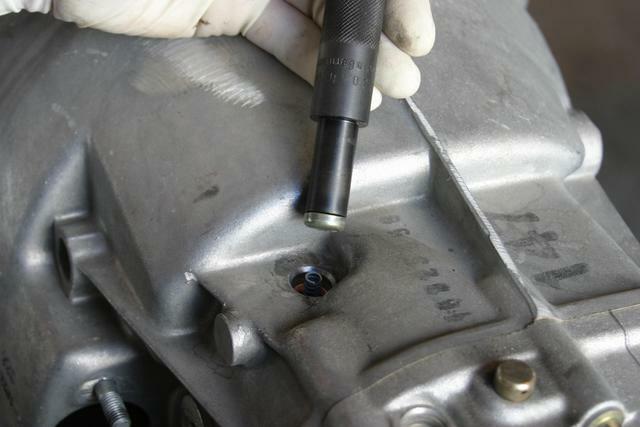 Remove the locking pin (BMW mirror switch removal tool used again here), then carefully remove the old unlined bushing by tapping a small screwdriver or the like between the bushing and the bore at the bushing's split. One you've got enough of it pried up, you can pull it out with needlenose pliers. Unlike the old bushing, the new one is lined (presumably a PTFE mix). The 5th gear locking pin was sticking on the old bushing. It slides easily in the new bushing. 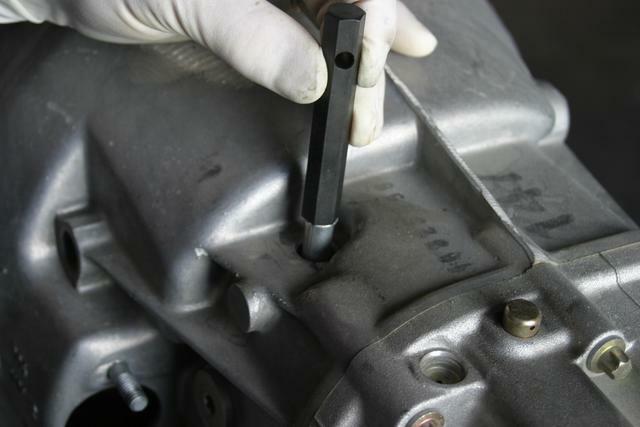 Use another BMW drift tool to tap the bushing into place. There are different drifts for the 5th and reverse gear bushings. They're the same diameter but have different final depths. 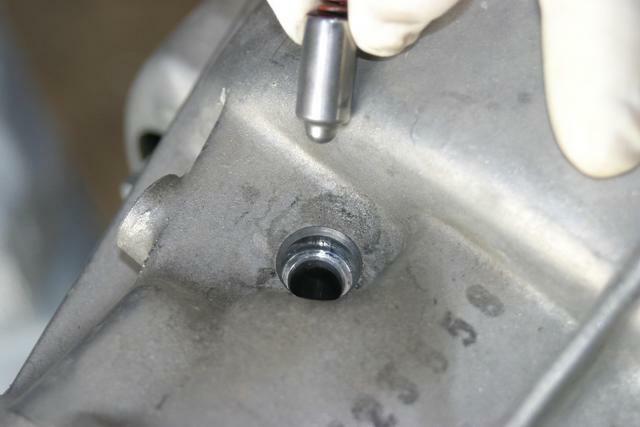 The correct depth is when the large diameter of the drift hits the transmission housing. The drift that goes deeper (023) is for the reverse bushing, the shallower drift (022 shown below) is for the 5th gear bushing. Randy and I did the two service actions on my transmission today. The one for the shift catch pins, and the one for the 5th and reverse gear locking pin bushings. 5 new bushings total, 5 new sealing caps, 3 new springs and 3 new pins. I wish I would have bought a new locking pin for 5th gear; mine is clearly worn unevenly. 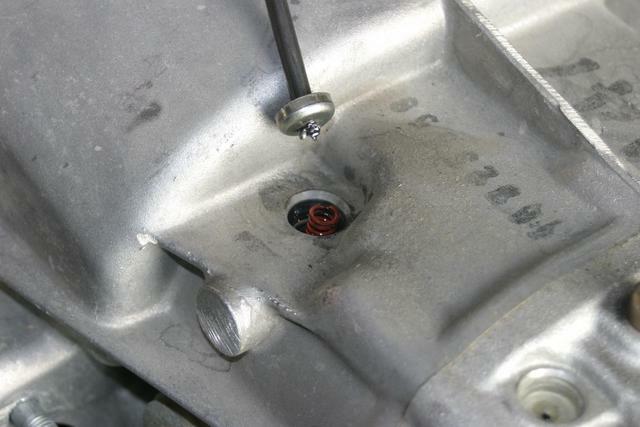 If you're doing this work, buy new locking pins for reverse and 5th gear. FWIW, the service bulletin says you need the repair kit 23.11.7.542.726, but in reality you need two of them; there's only one bushing per kit and you need two. Also need all the right tools, which I bought (4 drifts and a small slide hammer). 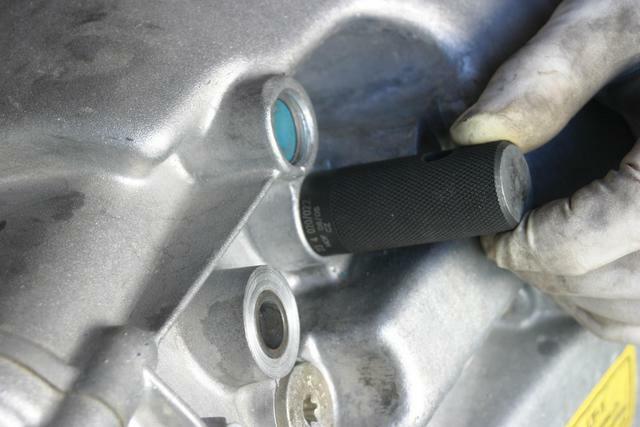 In stock form, all of the shift catch pins slide in the machined bore in the transmission case. I guess it's no wonder that they can develop problems with sticking in the bore; different materials with different expansion rates, and the bore doesn't really get wetted. The two forward ones were both quite dry, the rearmost one was a little wetter. The repair kit comes with 3 bushings (look to be lined with a PTFE mix), 3 new catch pins, 3 new springs, and 3 new sealiing caps. Everything went without a hitch. Auxiliary parts needed: all exhaust fasteners to remove the midsection, and the gaskets at the header end since they're graphite and mine were pretty much toast (at 31,000 miles). Looking at them, I'm surprised more people don't develop exhaust leaks at this point. Whatever slight binder is in those appears to melt a bit over time. I didn't take pictures, you'll have to take my word for it.